Former Florida governor says he'll decide on entering the 2016 presidential race after upcoming trip to Europe. 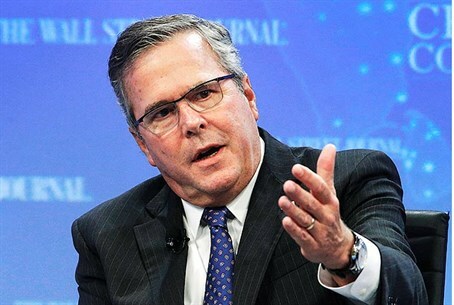 Former Florida governor Jeb Bush on Sunday said he'll decide on entering the 2016 presidential race soon after his trip to Europe, which starts in a week, reports The Associated Press (AP). Bush said he's already checked with his wife and children and they are "totally all in." Pressed on CBS' "Face the Nation" in an interview aired on Sunday on his plans to announce a presidential candidacy, Bush spoke as if the decision is not his own. "I hope I run," he said. "I hope, I hope, I'm a candidate in the near future." He added he would decide soon after his trip to Poland, Estonia and Germany in early June. Bush certainly sounded like a candidate on Saturday night when he said Sen. Rand Paul of Kentucky, an announced Republican presidential candidate, is "wrong" on his efforts to end post-Sept. 11 surveillance laws used against suspected spies and terrorists, noted AP. Bush has been critical of both leading Democratic candidate Hillary Clinton as well as of current President Barack Obama. He recently criticized the White House for its reaction to Prime Minister Binyamin Netanyahu’s speech to Congress and said, even before the speech was given, that he was “eager” to hear what Netanyahu had to say to Congress. Several weeks later, Bush expressed his discontent that Obama had held a meeting with Cuban leader Raul Castro. In a post on Twitter, Bush wondered why Obama had met with Castro while snubbing Netanyahu when he visited Washington. “Obama meets with Castro but refused to meet w/ @netanyahu. Why legitimize a cruel dictator of a repressive regime?” wrote Bush. Most recently he caused some uproar when he said he would have authorized the 2003 invasion of Iraq and pointed out that Clinton voted in favor of authorizing the use of force in Iraq ahead of the invasion. He later backtracked on his comments.